The life and art of "the King of Indie Animation." The only modern animator to personally hand-draw every frame in all of his work, Academy Award–nominee Bill Plympton eschewed a career in the high-paying but soul-crushing Hollywood animation industry to explore his own creativity as an independent filmmaker. Called "mischievous, mordant, analytical, and ceaselessly imaginative" by the New York Times, and hailed simply as "God" by Simpsons creator Matt Groening, Plympton is widely regarded as the hardest-working, most prolific animator in the business. His instantly recognizable and unique style catapulted him into the pop culture stratosphere and cemented his place in the pantheon of animation greats. In Independently Animated, the winner of countless animation and filmmaking awards juxtaposes the story of his life and art against the backdrop of the overall animation industry. It chronicles Plympton’s life from his childhood of Saturday morning cartoons to his most current and certainly adult-skewing animation. The book contains hundreds of pieces of art from his films, as well as never-before-seen drawings, doodles, production notes, and a full filmography. 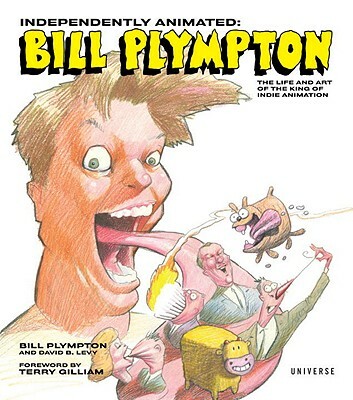 Bill Plympton’s cartoons have been published in the New York Times, Vogue, Rolling Stone, and Vanity Fair. His films are seen and heralded around the world. David B. Levy is an award-winning animation director, author, and animation industry expert. Terry Gilliam is an award-winning director, animator, and author best known as a member of Monty Python and for the films Brazil, Fear and Loathing in Las Vegas, Time Bandits, The Brothers Grimm, and The Imaginarium of Doctor Parnassus.